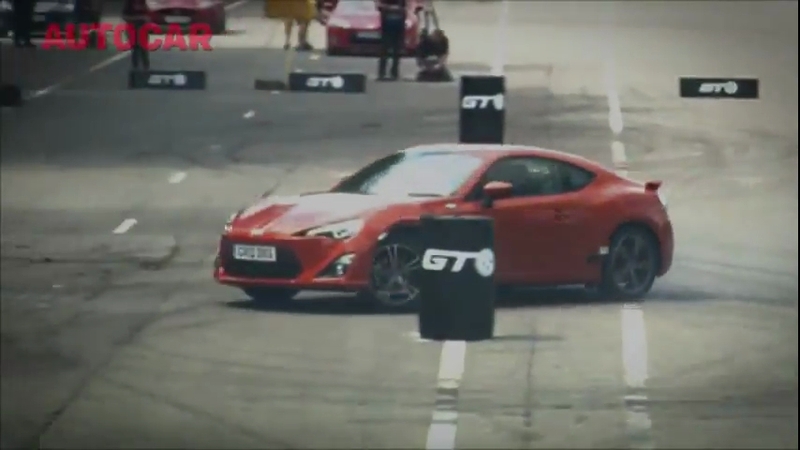 Yes, this isn’t news off the press. 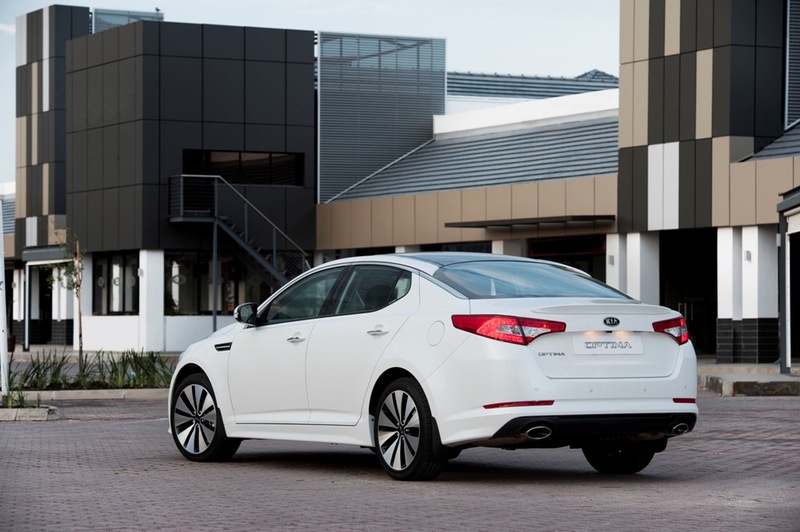 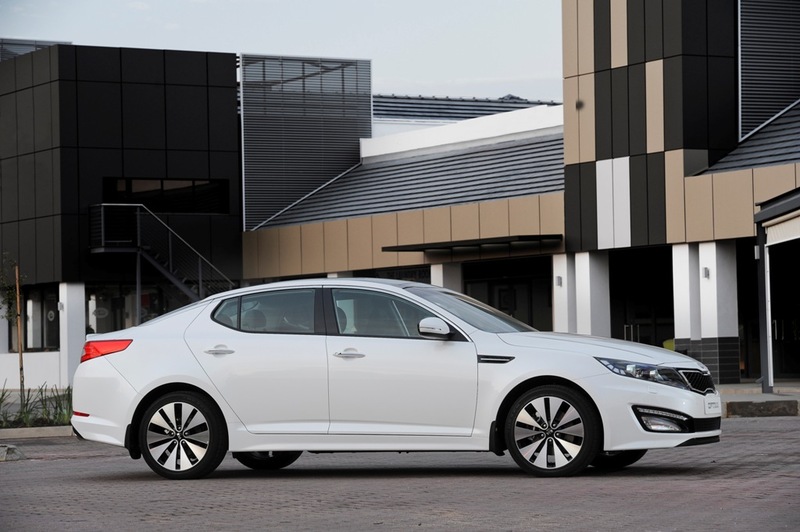 The mid-size Kia Optima sedan was officially launched in South Africa earlier this year in April after a two year long wait having been launched globally in 2010. 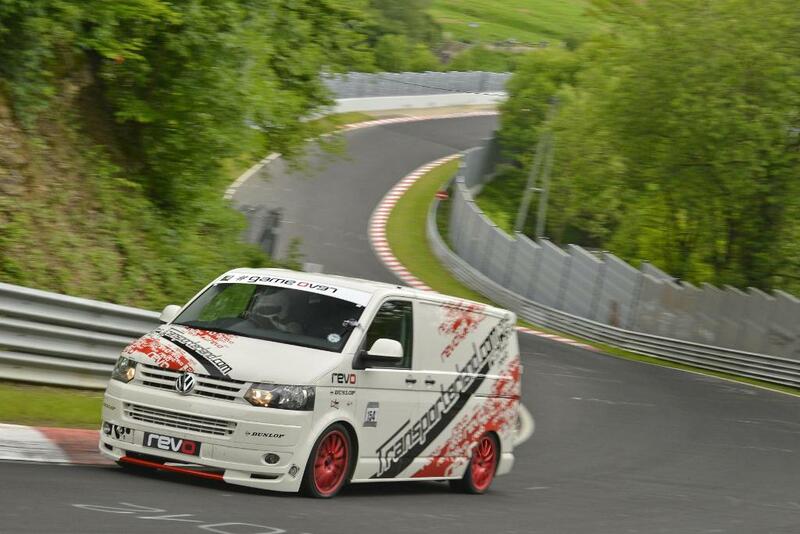 But who’s complaining at least its here. 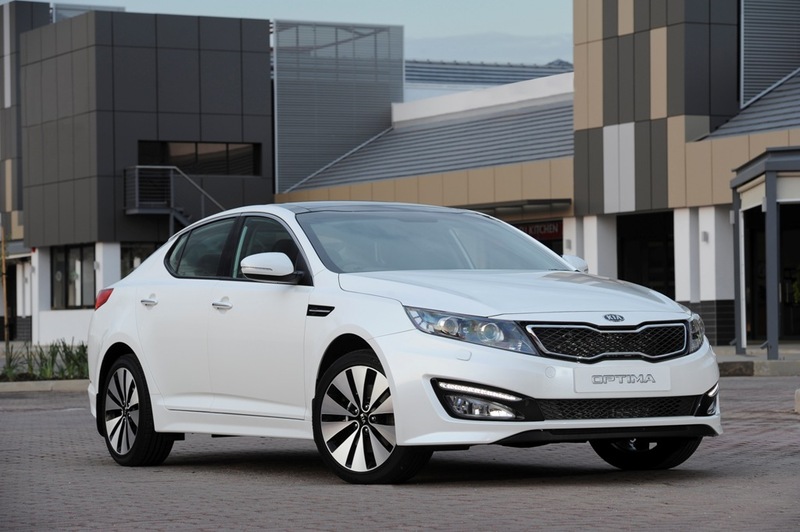 Under the direction of Kia’s Chief Design Officer Peter Schreyer, the Kia design teams have created the third-generation Optima, boasting highly competitive performance as well as an all-inclusive luxurious package. 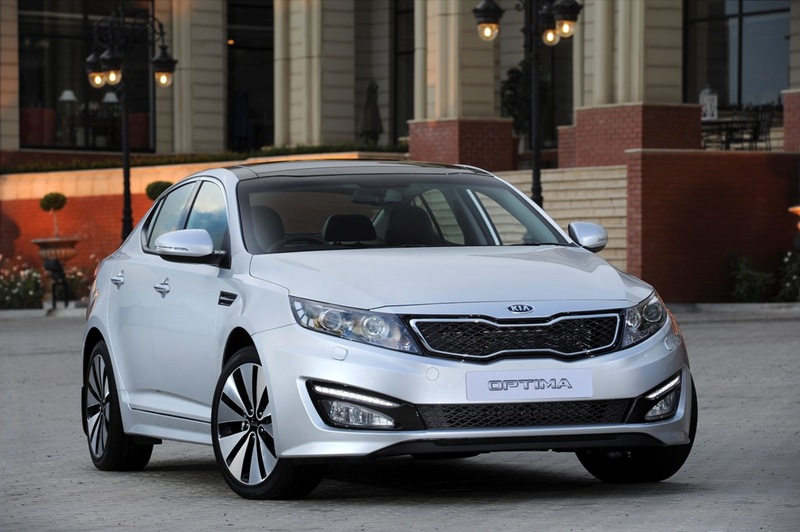 The Optima is an intelligent combination of Korean, European and American design qualities, a visual display of Kia’s new design confidence. 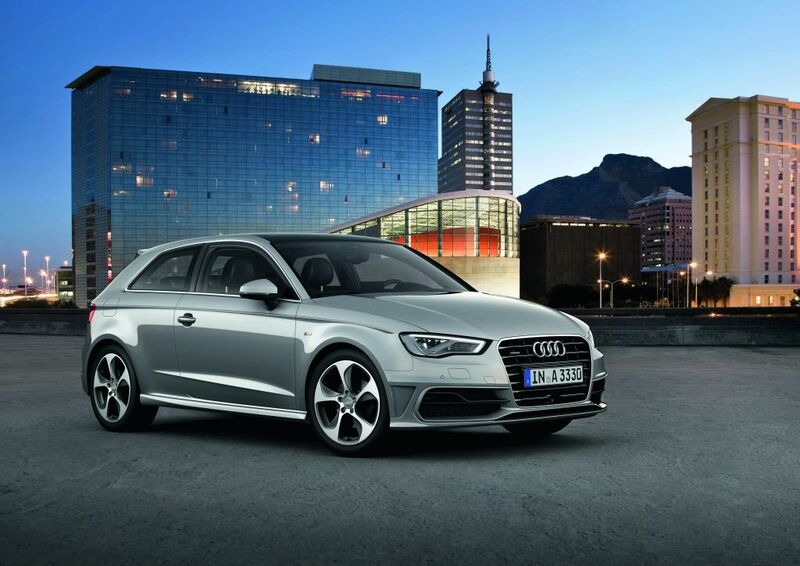 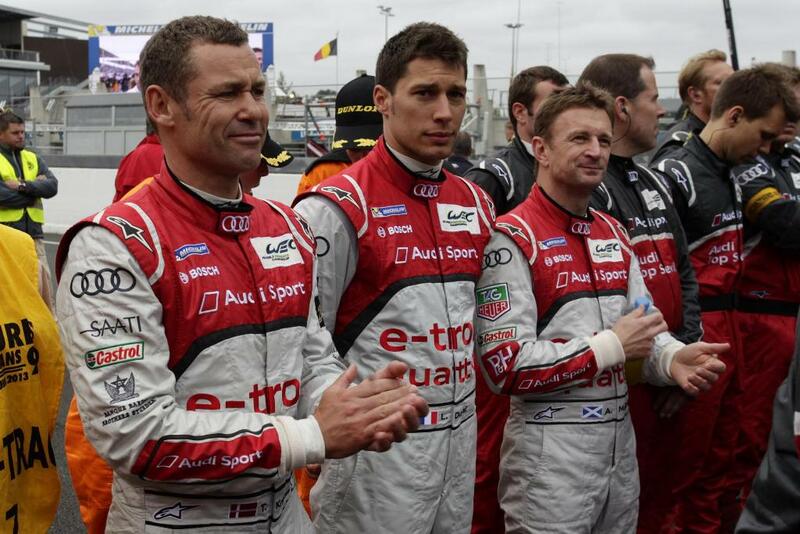 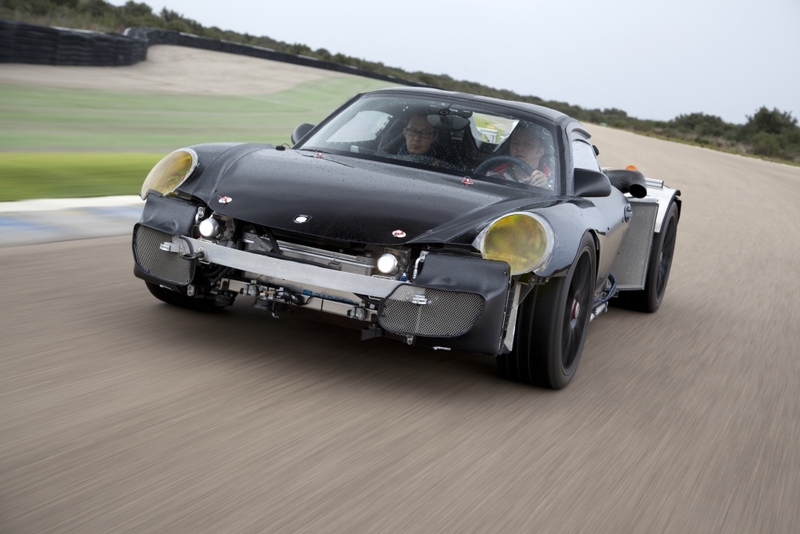 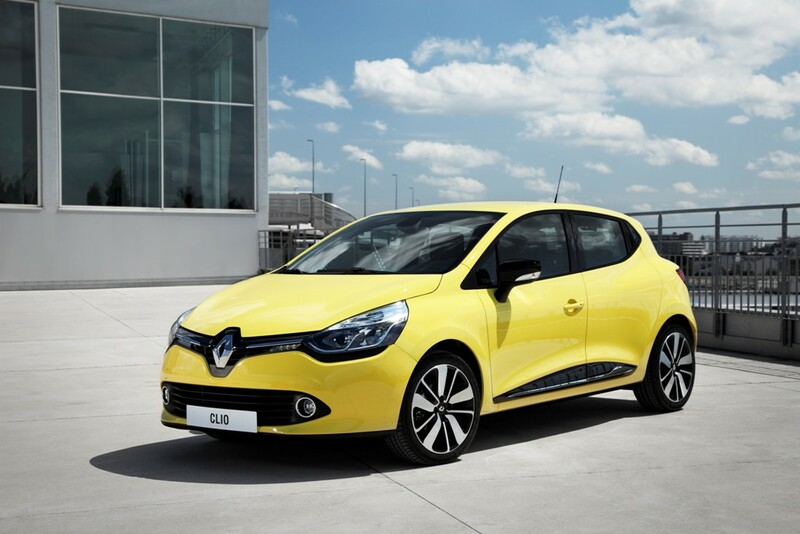 It will stand out on the road, in the car park and in traffic,” concludes Schreyer. 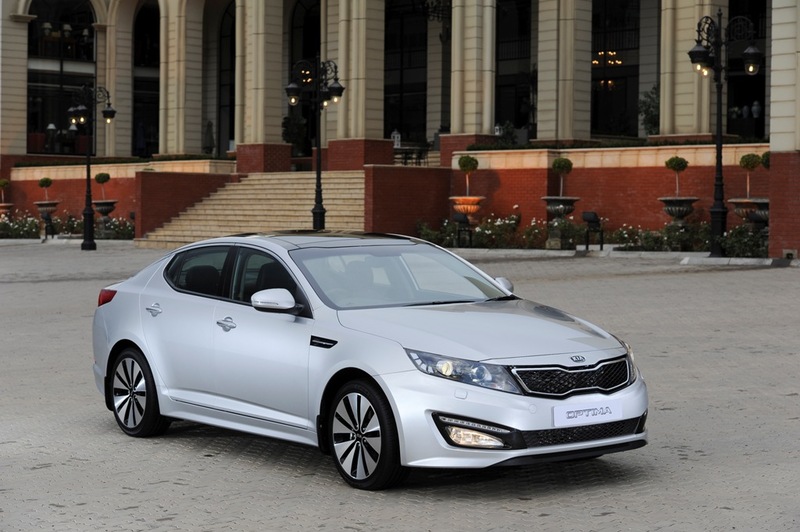 The Kia Optima is available with the 2.4 litre Theta II petrol engine with a six-speed automatic transmission. 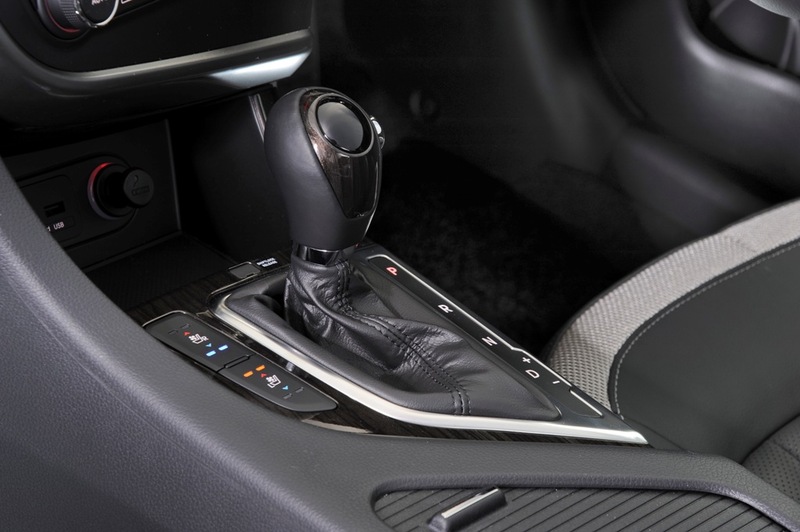 The automatic transmission offers two operating modes, fully automatic and ‘Sport’, which allows for clutch-less manual sequential gear changes for greater driver involvement, by either using the centre console selector lever or the new steering wheel-mounted ‘shift paddles’. 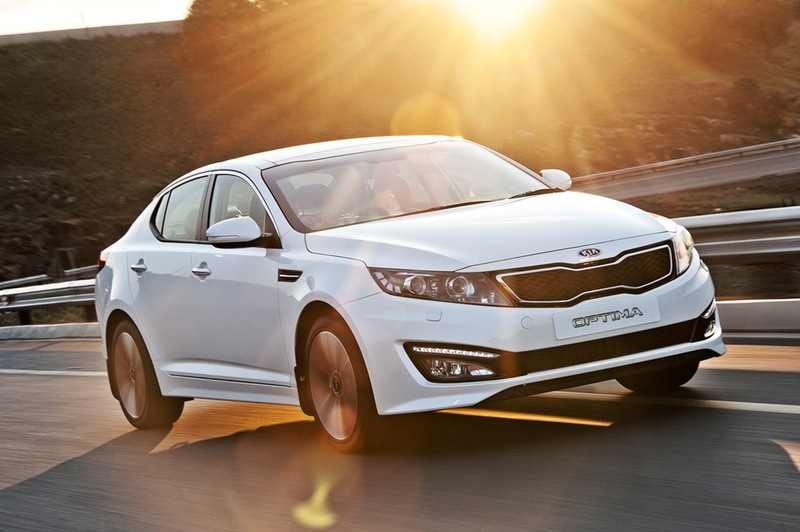 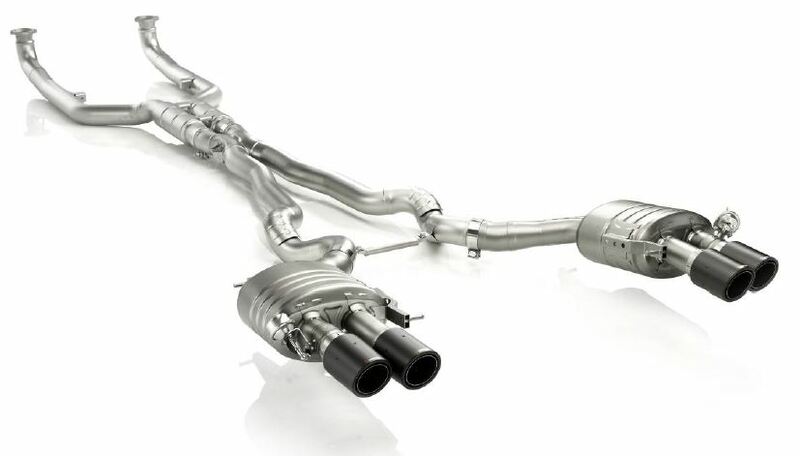 The 2.4 Theta II MPI generates maximum power output of 132 kW at 6,000 rpm, with 231 Nm of torque at 4,000 rpm. 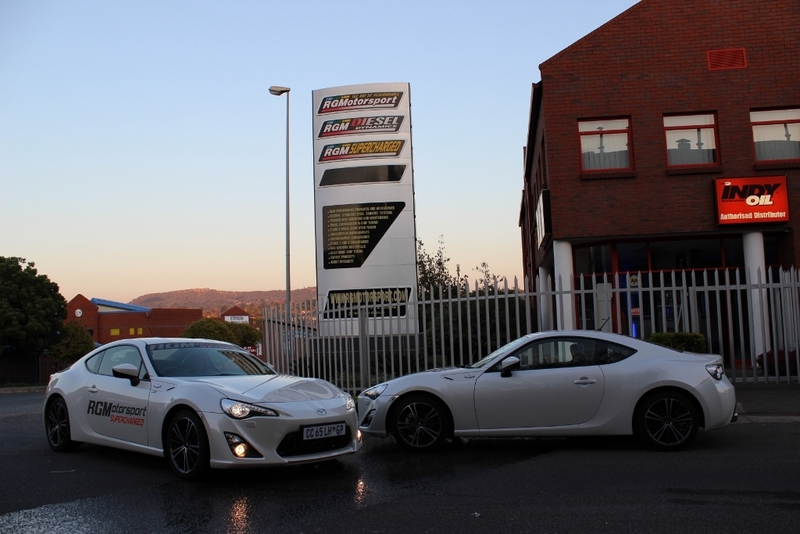 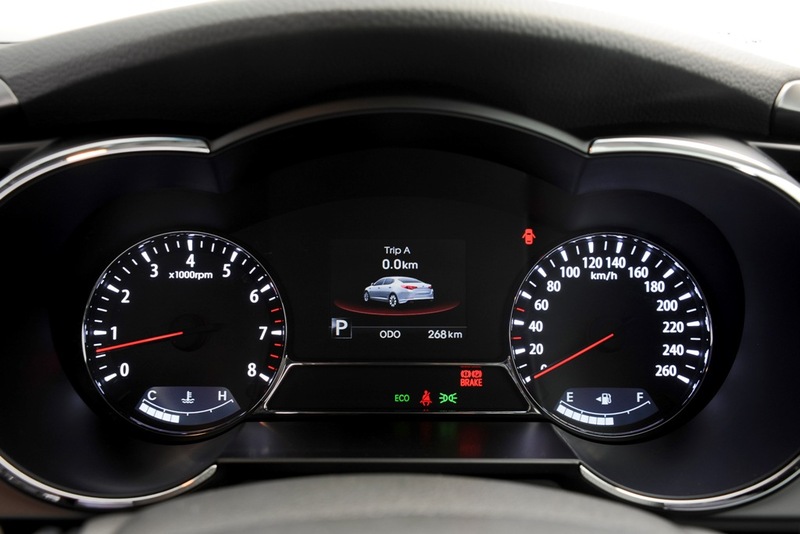 The claimed fuel consumption is 8.7l with CO2 emmission figures of 207g/km. 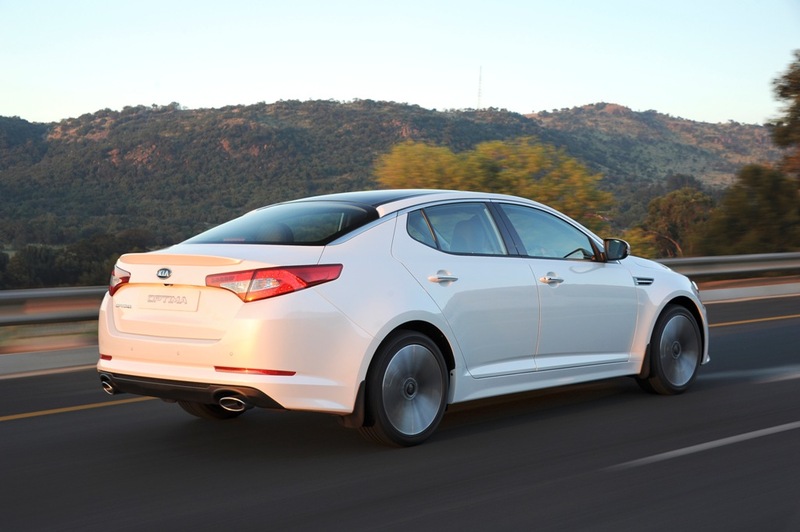 The claimed 0 to 100 km/h acceleration of the Kia Optima is 9.5 seconds and reaches a top speed of 210 km/h. 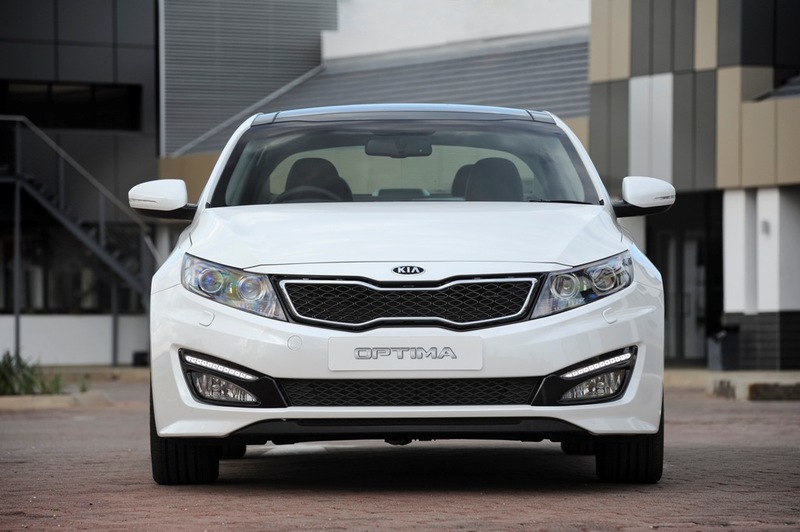 Some of the key interior features of the Kia Optima include; the new 8-speaker InfinityTM Sound System, keyless entry with Stop/Start button, heated and ventilated driver and passenger seats, LCD display set within the interior rear-view mirror which improves visibility in reversing manoeuvres by making use of rear-view camera, the four-spoke multifunctional steering wheel, and a fully automatic dual temperature control. 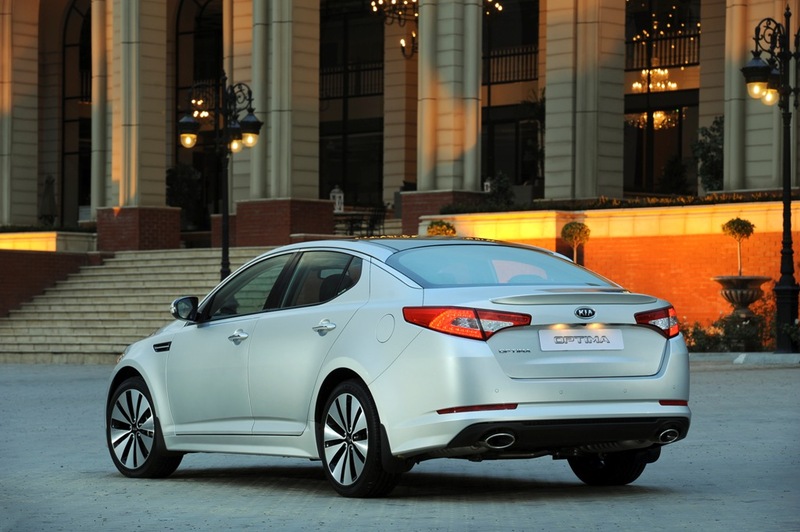 On the exterior the Kia Optima has Xenon HID headlamps with built-in Daytime Running Lights, LED rear combination lamps sporty 18-inch alloy wheels, dual exhausts with chrome tips, outside mirror turn signal indicators, fog lights and heated outside mirrors, as well as an optional, full panoramic sunroof, to name a few. 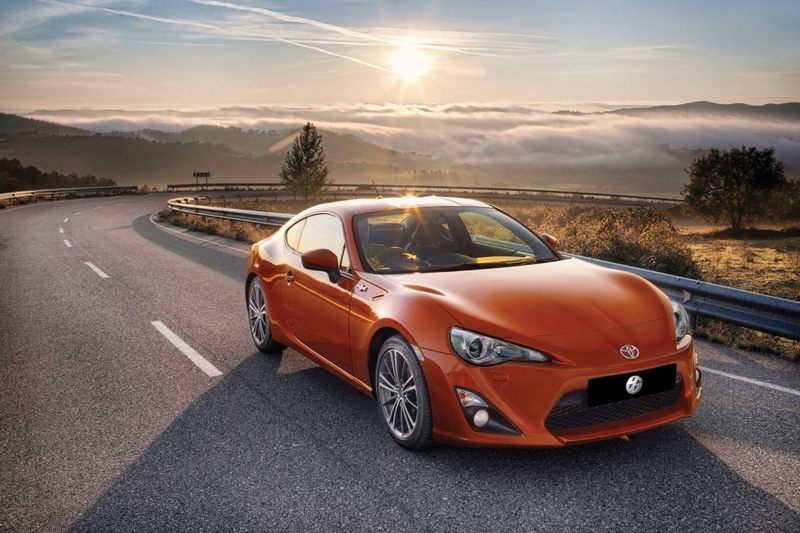 The Xenon High Intensity Discharge (HID) lamps also come with headlamp washers, plus a new static bending lamp which provides additional illumination of the ‘nearside’ road and the verge during cornering. 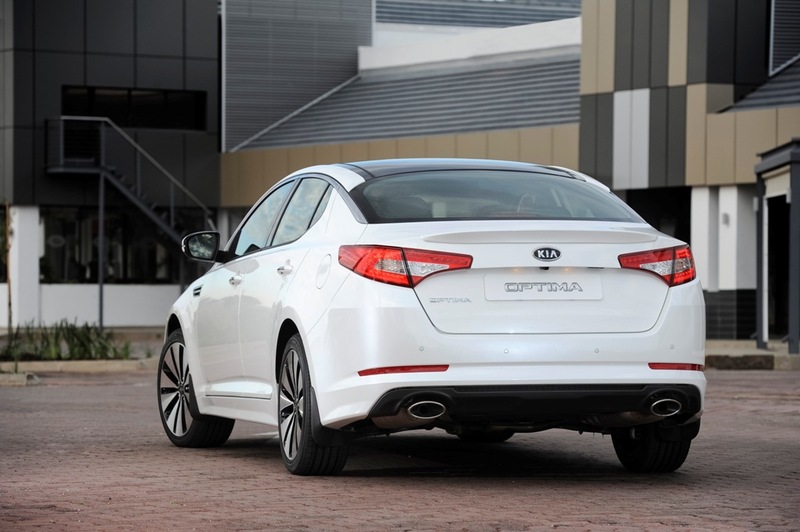 Luggage space is a generous 505 litters (VDA) thanks to the more compact design of the rear suspension with less intrusion into the trunk. 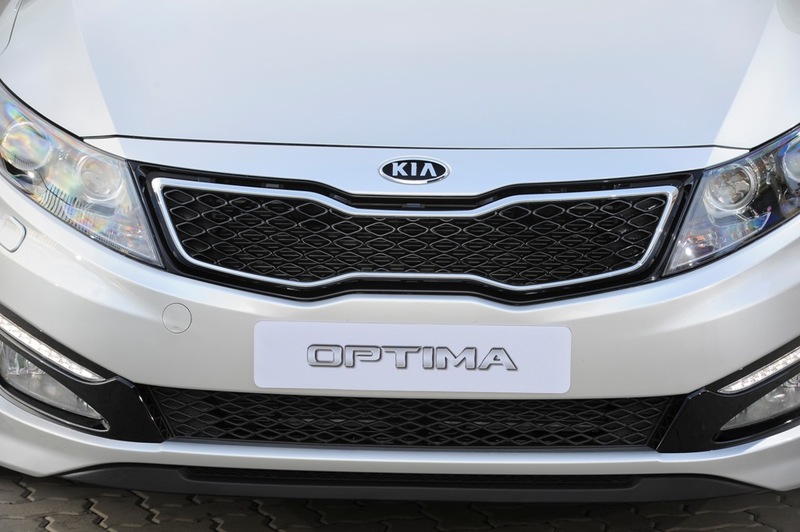 The new Optima presents buyers with a range of state-of-the-art active and passive safety systems and equipment as standard. 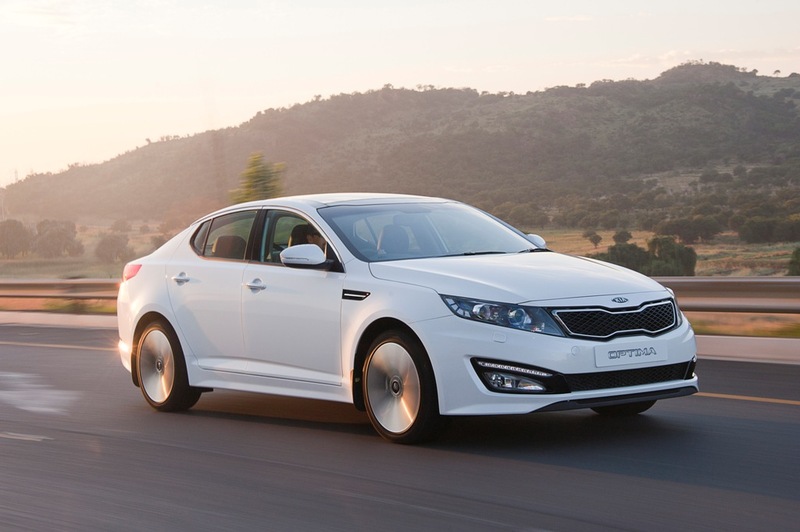 Available active safety technologies to help Optima drivers avoid potential accident situations include ESC (Electronic Stability Control), TCS (Traction Control System), BAS (Brake Assist) and HAC (Hill-start Assist Control). 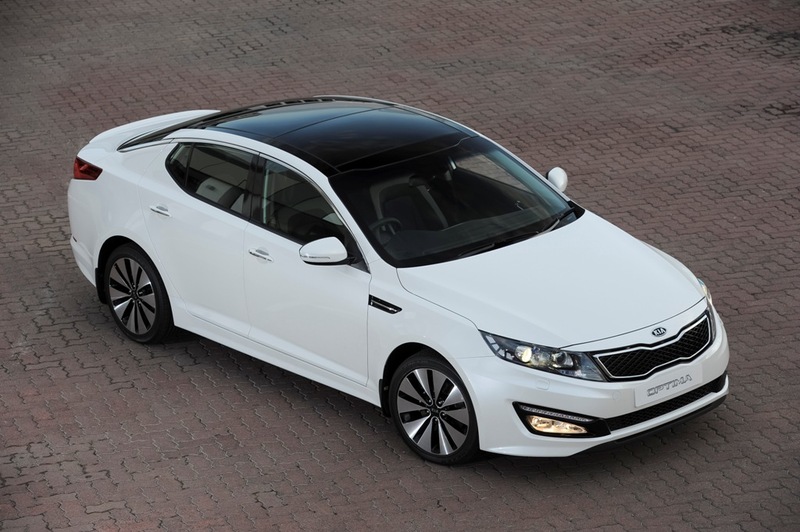 The Optima comes standard with six airbags – dual front airbags, dual front side airbags and full-length side curtain airbags offer head protection for all occupants. 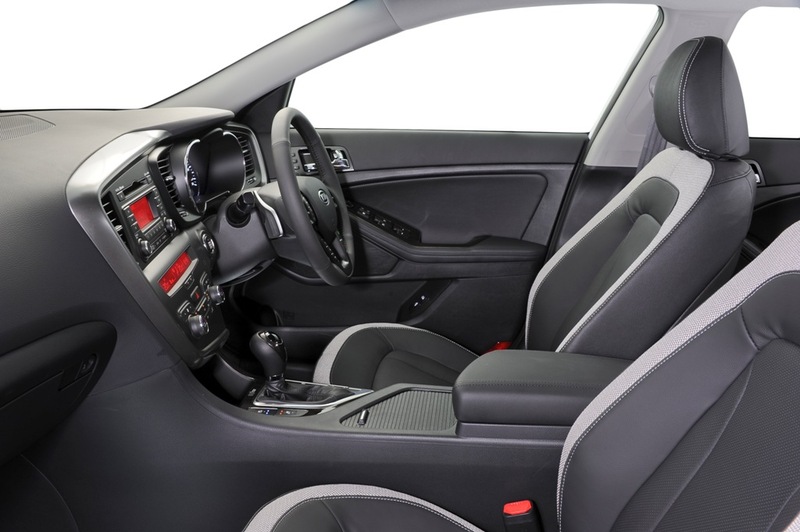 Active head restraints for the front seats protect occupants against whiplash injuries in the event of an accident or sudden braking, while the Isofix child seat anchors protect small children in the event of a collision. 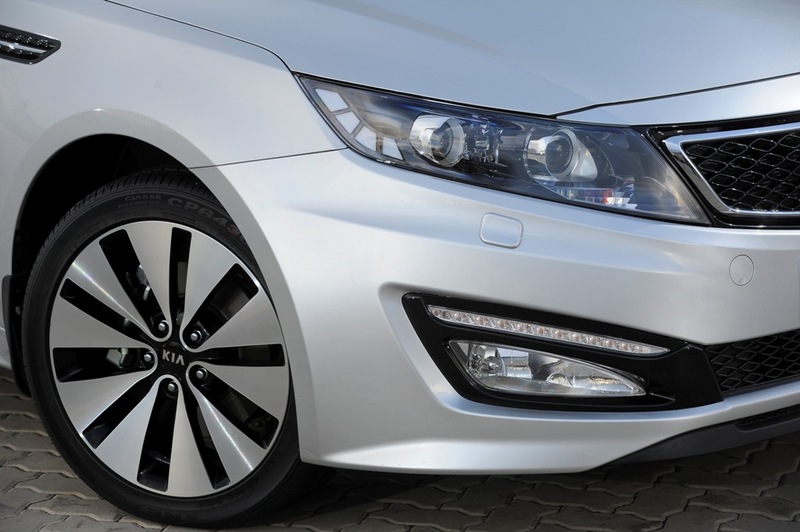 The design of the front hood has also been designed for improved head impact absorption to cater for pedestrian safety. 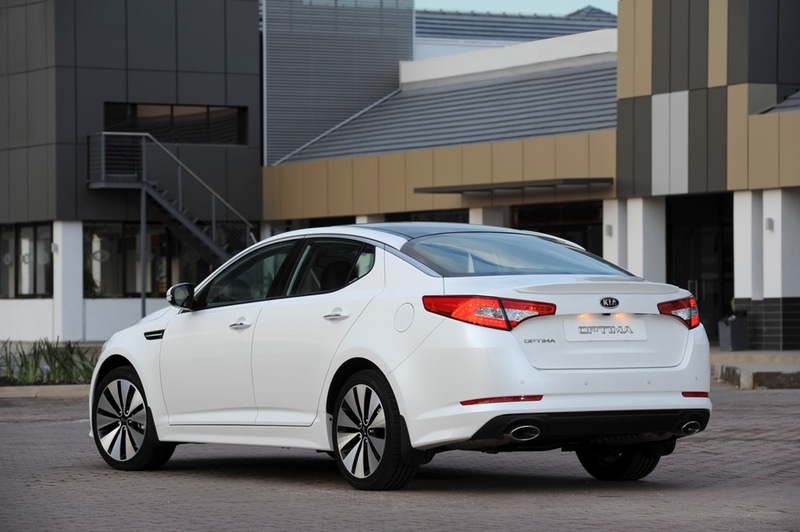 The recommended retail price of the Kia Optima in South Africa is R305 995 inclusive of VAT. 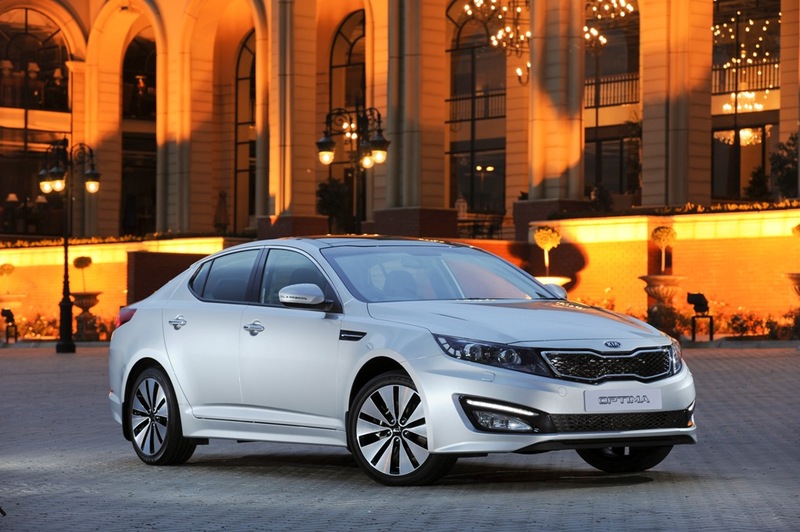 A detailed review of the Kia Optima can be found at Car Magazine.